Note: I updated this post in November 2018 because this is such an important issue and I want to give you more resources and insight. But we have to be careful, because there’s a fine line between supporting others and trying to “fix” them. 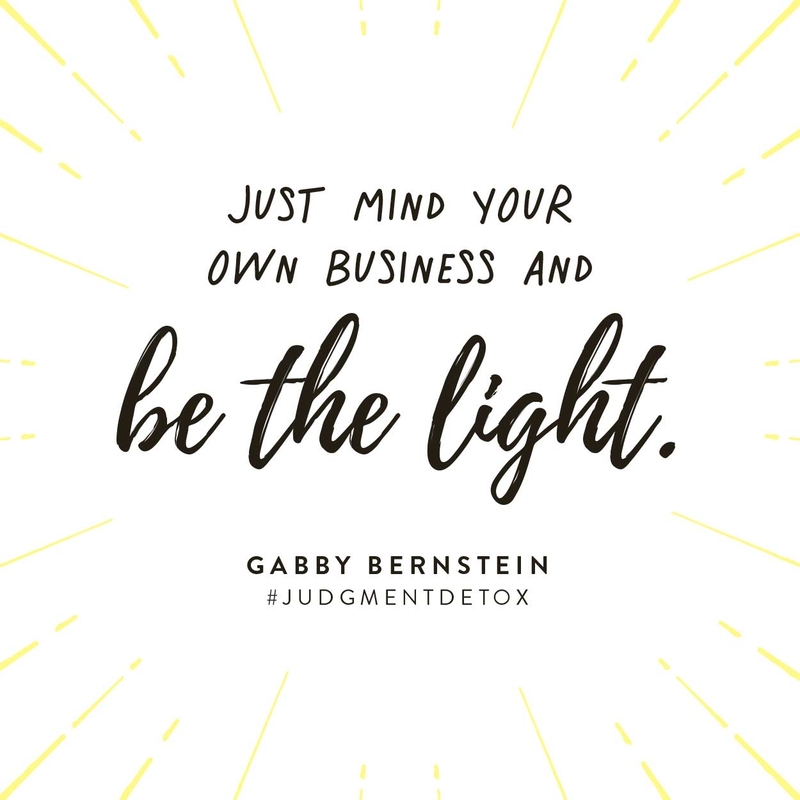 This is something that has been on my mind lately as I’ve seen new readers discover my book Judgment Detox and begin to lovingly witness their own judgment and heal it. You can watch the original video I recorded below, and keep reading for a breakdown of what I teach in it (plus new lessons). A friend was telling me about how she was visiting a very close friend of hers. This friend was going through a tough time, and when my friend left, she felt this heavy weight on her. She felt a responsibility to make sure her friend was okay. She also felt inadequate because she couldn’t solve her friend’s problems. While you can’t fix someone else or be responsible for their happiness, here’s what you can do. Finally, if someone you love does come to you asking for help, there are some resources you can share. I include some resources around addiction recovery in this post and at the bottom of this post. I also share some resources for anxiety and mental health in this post. But just remember that you can’t coax, guilt or force anyone to take action. 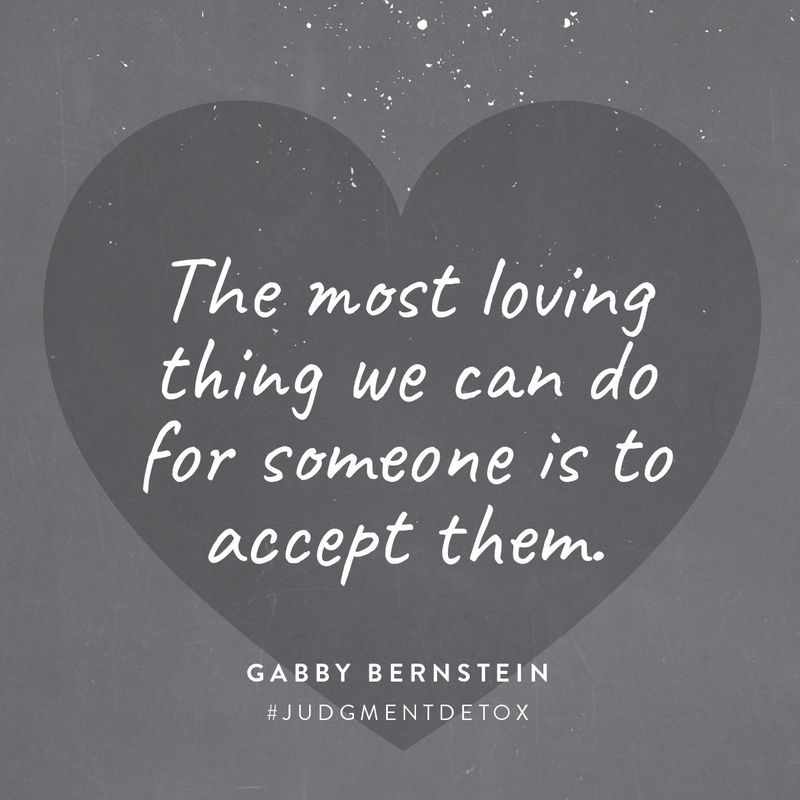 As I teach in Step 4 of my book Judgment Detox: The most loving thing we can do for someone is to accept them. The most unloving thing we can do is try to change them. When you try to change someone you’re effectively saying that you know what is best for them. Your unsolicited “help” is a way of controlling and judging them. People may not be show up the way you want them to, but when you accept them where they are you can let go, forgive and release. Accepting others where they are and forgiving them doesn’t mean that you let someone walk all over you. It doesn’t have to mean that you endorse what they’re doing. It means you allow them to be where they are and you don’t try to change them. Important note: If you are in an abusive relationship, visit The National Domestic Violence Hotline online or call 1−800−799−7233 or TTY 1−800−787−3224. For more guidance on what it truly means to accept and forgive, check out this blog post on forgiveness. By consistently practicing to accept someone where they are and see them with compassion, you realign with your true love nature. Through acceptance you release the resistance you’ve placed within your relationship, clearing the way for healing and for you to access more loving thoughts and feelings. When you change your thoughts and feelings about another person, you change your energy toward them. The other person will receive your shift in energy and feel released by you. Best of all, your shift in energy gives you momentum to continue releasing judgment so you can feel complete and free. Acceptance offers you this freedom. Release judgment with my free mini course! 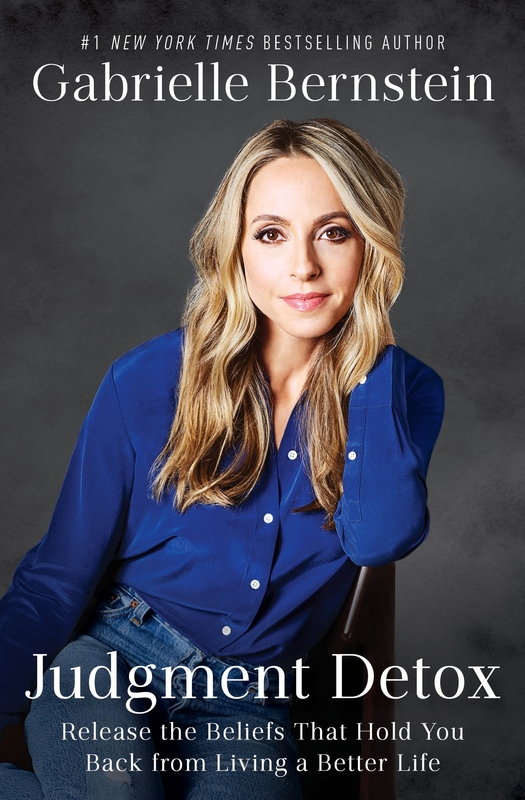 I made a free mini course that guides you through three core practices of my book Judgment Detox. One of the practices is a beautiful prayer that will help you release the desire to fix someone or be responsible for their happiness. It doesn’t matter whether you’ve read Judgment Detox, you’re in the middle of it or you haven’t started it yet. You can start the Mini Course today and experience beautiful benefits. Thank you for this reminder. I tend to try to push people I love towards solutions I can see that they aren’t seeing… but when you push things rarely work the way you thought they would! It’s very true that people will only change when they want to. Appreciate your weekly videos. Always nice reminders to start the week. Thank you…needed this…sponsoring someone in NA who threw their sobriety away this past weekend…still sad…but praying for them…she’s only 23 with 2 small children…. Wow, thank you for this. Im like a helping junkie and in result my life is totally broken down because I forgot to rebuild myself & it lead to adrenal fatigue. I have to get over the guilt of not helping and the guilt that God isnt expecting me to save people, even if it means my young adult child. Thank you so much for this – I am literally going through this now. I’m have been trying to fix someone and I know my family is trying to fix me. It’s like a domino effect! I am waiting for guidance to know what to do for the best. I keep changing my mind often – I need to surrender. So I met this man… And he fell madly in love with me. And for so many reasons; I’m not ready. I told him today. Broke his heart, and mine. Still I feel light and supported and after this video, safe in knowing I did the right thing. I’m not responsible for his happiness. He has a lucky woman waiting for him out there. Yes. Thank you. Thank you, Feels like great advice I will be trying this. I always feel responsible for my Nan’s happiness, she’s 84 and a very difficult lady at times and that has nothing to do with her age just the way she is and has always been. I’ve just recently got to the point where I have actually said I can’t be responsible for her happiness or even try to make up for the things she’s not happy with in her life. Firstly because it doesn’t make her happy and secondly it really doesn’t do me any good either. With people who are getting close to the end of this lifetime, and who’ve resisted the plunge to the bottom for the whole of their lives, the approach which will probably work best is to make sure that your own contribution to her remaining years or days is one of unconditional love. Remember that her always being “a difficult lady” describes how you have felt about her attitude, and that you have the magnificence and magnanimity within you to choose to feel the love of one whose own life has been enriched by the lessons she’s given you for your own development. Your Nan has probably had a hard time presenting you with those lessons. She deserves your deep forgiveness, gratitude and love. That’s what will serve you both the most deeply, and it’s something you’ll never regret. What you’ll also notice is that your Light will shine more brightly than ever, and your presence will be a blessing to everyone you encounter. 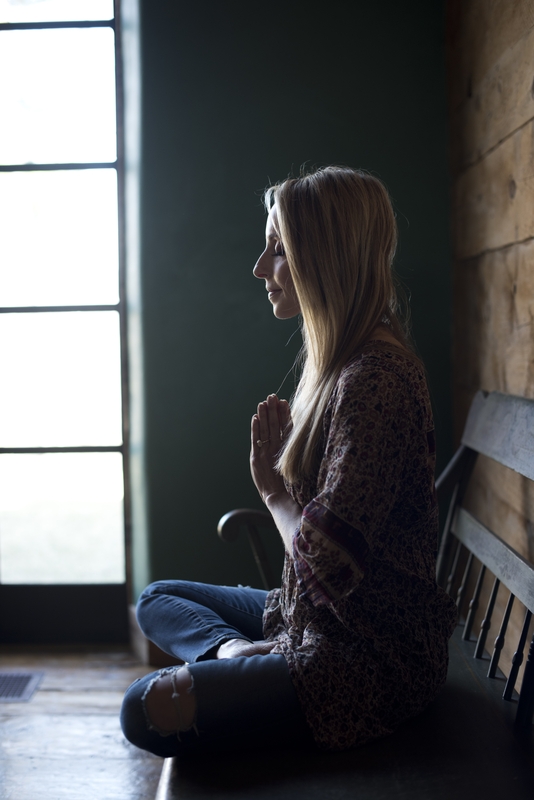 Your post has reminded me to shift over what I can “control” or hope for: I can control my support, and I can send her my guidance through meditation and energy, to be calm, nurtured and open to receiving what she needs from whom she needs it from. Thanks as I travel on this long journey with her. Always do WHAT you can for those you love: it’s possible it may not be enough. Make certain they know that can ask you for anything. Thank you Gabby. I’m guessing that this applies to 13 year old daughters as well?! x. Back in 2010, you gave me that advice in our coaching of “Do not deprive [this person] of his bottom.” It is a piece of advice I never ever forgot. I still sometimes get in moments of I have to fix this! but within seconds (seriously!) I remember let them hit their bottoms, let them make their own decisions toward their own happiness. Otherwise, I’m neglecting my own happiness but obsessing over fixing their stuff. Thank you, Gabby. So needed on this Monday morning. You were speaking straight to my heart. Blessings. This is a big topic for me and for members of a family group I facilitate. Thank you for the reminders because the ego is insidious, especially for parents. The desire to control outcomes instead of doing our own recovery work is a huge temptation. Such a good one. Thank you. I’d love to learn more from you about dealing with serious loss or grief and your thoughts on duality or shadow sides. Thanks for all you do ???? My emoji was replaced with question marks! No! *Thanks for all you do. Period. I’d like to thank you for this blog this morning. It was just what I needed to hear! I got up feeling how can I help my son he’s going through a really rough time. Chris has been someone who’s always had everything together accomplishing one amazing feat after another! Top in his class all through his education. Loving and kind to all and always wanting to share and give of himself. Since he came back from his study abroad program last year He has been going through a depression. He’s graduating in a few months and just keeps saying he doesn’t know if he can make it. This is a young man who carries a 3.9 GPA and only needs one and a half credits to graduate .So it freaks me out a a lot to-hear him say this ! He’s one of the most kind, talented ,intelligent,and beautiful souls I know in this world. And I just want to help him in anyway I can ,because it pains me as his mother to see him hurt this way. So Thank You ,Thank You, from the bottom of my heart, to get up this morning and Hear your words! I understand that he really has try to help himself. I can only help so much. I can’t fix everything for him. although ,I would do it in a heartbeat if I could. I Must have faith he has his own guidance and spiritual protection and know it’s with him. I will just TRUST in that ,and keep him High in my thoughts &prayers!! Sending you much love, Rhonda ???? Thanks Gabby! Just finished my meditation and for some reason decided to open my email box and saw your new vlog- divine timing. One of my friends just found out from his diagnosis he may need a liver transplant and feeling grateful for this intuitive wisdom to step back in support of his guides and let him have his full experience… while sending love and prayers to his healing process. I feel a whole new sense of freedom and empowerment now. This is HUGE for me. I moved across the country in order for my parents to live closer to their grandkids. But, soon after the move, I felt my soul getting smaller and smaller… my mental health slipping… and 2 years into the move, my body complete crashed. I crashed so hard, I had to take a leave of absence from my job and when I did return, I returned part-time. I spent a lot of money… and visited many doctors thinking that, “something was wrong with my body.” The truth is, I never honored MY boundaries… I was feeling responsible for everyone else’s emotional states. I live in a place I don’t like living because I feel the duty to make my family happy. I will say that it’s been a long journey, but today I do realize the direction I need to head and have already taken many steps to help protect my own energy as well as set up boundaries so I’m not taking responsibility for my family’s happiness. I’m not sure what this will translate into, but this video is just another tool for me to get back to honoring myself. Good advice. I have a friend who always expects me to fix her. These are good points to follow. Wish me luck! Great advice Gabby. We are not responsible for another’s journey. Though at times it may be difficult to let go of the intention to help someone close to us. We are powerless. This is an affirmation of what I just recently accepted for myself. I am not my mother’s emotional crutch. Nor am I responsible for her happiness. She must come to see that her position in life is a result of her own decisions. My responsibility is to honor her as my mother, period. This. All of this. Thank you. Such a struggle for me on a daily basis. In addition to feeling responsible for other people’s happiness, I also feel like I shouldn’t be happy while someone close to me is unhappy. A perfect example is when I have a great day but my husband comes home stressed out. I end up feeling guilty for my joy and don’t know how to support him while maintaining my happiness, without disregarding his feelings. It also works in the reverse if I am upset and others are happy, I feel like I need to mask my own feelings to be able to support their feelings of happiness. If you have any more advice on this I would be so grateful. Thank you so much for your light and work. You truly inspire me and always give the exact message I need to hear. As one who wants and tries to fix everyone’s problems, this was a very much needed and timely video. Thank you! I am prayerful I will be able to deal with the seemingly withdrawal of my friend and to wait patiently for her return. MExcellent!! I so need to listen to this every day!!! As a recently retired Social Worker I have found myself trying to ensure that all my family members are ok and happy. Being reminded that I cannot fix everyone that I love is such an important reminder. Thank you Gabby!! ???? May God continue to bless and keep you ????. I needed this today. I am going through scheduling a client that says she wants a reading but her actions speak very much to the contrary, and she’s stepped on my boundaries around scheduling. I want to serve, but at the same time, I want to make clear that a tarot reading won’t fix her problems nor make her happy if she isn’t willing to do the work. Thank you, Gabby. Sat Nam. I’m still store from Kundalini yoga with you on Saturday! It was seriously the most fun I’ve ever had working out. Thank you for everything you do! It just needed to hear this! Thank you so much for the work that you’re doing! I completely agree with this Vlog. I do find it frustrating, however, when people make you feel like you are responsible for either their or someone else’s happiness. It’s the guy a family member or friend pressures you to go out with (someone you aren’t interested in) to make them happy, the event they want you to go to (even though you don’t want to) because it makes them happy, etc. There’s a lot of pressure to succumb in many social situations and if you don’t, you are considered selfish, close-minded or snob ha…I know that sounds dramatic, but I’ve been in these situations various times and it always comes back to making someone else happy — and that someone often isn’t me, in fact, I’m rarely even asked what I want. Wow, did I ever need this post today! Gotta love the spirit’s timing! Very well said and a great reminder. Thank you. I loved the line – You can’t change anybody unless they’re in diapers.” 🙂 What’s sad to me is when someone is in the last stages of their lives, and they still thrive on the hurt and pain that others have caused them throughout their life, and I realize that they’ll never be any different, nor do they really want to be different, I suppose. Just seems like such a waste of energy. But it’s not my journey, it’s theirs. That’s what I have to remember, and I just have to love them and not take it personally. Thank you, Gabby. I believe God sent your message for me today. I’ve been bringing myself down, because my sister has MS and I feel guilty every time she tells me I have legs and she doesn’t. And, I worry constantly about my adult daughter. You’re right. Prayer is the answer. I don’t know why I didn’t think of it. Plus, I need to pray for help for me to do be able to stop thinking I’m responsible for their happiness or to feel guilty. Thank you. You are in my prayers. Thank you so much for this post! It was exactly what I needed to hear today! I literally just walked in (before I read/viewed this) from having lunch with a friend. She has been going through a really tough time. I listened to her as she needed to “talk”. And I wanted so to help. I came home feeling so tired, so heavy! Thanks so much! This is exactly what I needed to hear and must remind myself when I put pressure on myself to fix loved ones. Thank you! Thanks Gabby for this timely video. I’m going through a major change in a relationship where I was not trusting that this person had her own spirit guides, I was depriving her of her bottom and I was forcing her to change. Thank you so much for articulating this so beautifully. I can finally put to words why my relationship with her was not working. Now, I can imagine her surrounded by her spirit guides, I can send her love and pray that her process is a gentle one and I’m now open to support her when she is ready. I feel lighter now…thank you! Thank you Gabby! My three boys and I unexpectedly lost my husband this past November. My oldest step son turned 18 just five days after losing his father. Around the time Ray was first diagnosed in September Rays father was diagnosed with stage four liver cancer. Yesterday the boys and I lost their grandfather too. I have had such pain and worry about how I’m to parent these boys through such trauma and loss when I am heartbroken as well. This blog couldn’t come at a more perfect time for us. I know that I am doing the best I can and that I am guided but I needed to be reminded that they are guided too. All my love and gratitude. Bottoms are so very valuable! I had my own a few months ago and it has been the best thing that has happened to me in a long time! Divine timing Gabby. I just finished reciting a ‘liberation prayer’ for all these people I encountered this past year that I feel still have attachments with me. My reciting this prayer energy was my way of releasing this energy so that I and we all can move on towards our own spiritual growth. It then dawned on me that I seem to have taken a great deal of responsibility for other people almost unknowingly…and that I in fact am not responsible all the time for supposedly “hurting other people” unintentionally or otherwise. I can only apologise but on the other side, I cannot apologise for my presence and I too require support and assistance too. What I mean is that I feel as though some people need to choose their battles more wisely, and are choosing to get upset with you from more of a place of feeling uneasy around you and your being over other things. Just what I have encountered recently in my findings with others. Sat Nam. This was exactly what I needed today. My son is an active alcoholic and the last 5 years have been a rollercoaster of crazy. The points you made are spot on, I feel I have hit my bottom with what I now see was my codependancy. The 3 points you made resonated with me deeply. Thank You!!! Gabby! It is ridiculously crazy (okay, maybe not that crazy because God is very intentional) that you would speak on this. Right now.. my future spouse who is currently not as spiritual as me (yet) is going through his bottom. And what I have learned is that I am so into “saving,” helping, giving, nourishing, coddling/making everything better for people that I had to stop the other day and realize that me doing all of those things and going into “save the person mode” will not help him, it will hinder him. Just like you said in essence, stop stopping the other person’s “bottom,” you are SO right. I had to go through it just like he is now, and I changed for the better. Now he has to, and I have to know that just like I got through it with guidance, love and direction, he will too. And he has to do it on his own so HE can learn to lean on the higher power like I have and continue to do. And this video was all just confirmation that I’ve done everything that I was supposed to to prepare him, now I just have to be patient and wait in a sense. Thank you so much for this! From reading some of the comments it sounds like many here are the fixers. so for me this hit me in a different way. For me I keep wanting to be saved and loved!! I do get in a good place but then I fall back again. This past week I’ve fallen to a hole I can’t seem to get out of. I just want someone to care, and I keep telling myself that no one does care. I don’t know how to take care of me and be okay!! I know I have a very hard time trusting God, so that is one of the issues for me but I just don’t know how to. This I really needed to hear so thank-you!! I just want to be happy!! I am so sick of feeling the way I do, and watching everyone around me being happy! I want that too!! Thank-you!! This was once again the most perfectly timed message from you. My brother in law has been in a funk for the past 6 months and he has been pushing his loved ones away. Yesterday I was calling everyone in the family trying to see how we can get him to snap out of it. He has been so rude and I found myself talking negatively about him which didn’t make me feel good at all. I watched this just now and instantly got it. Thank you Gabby. I am a “helper” and a “coach”, “healing practitioner”, and “lactation consultant”. I am a mom and a wife. Much of my adulthood has been spent with someone that has periods of sobriety and periods of falling-off-the-wagon, crazy-making, etc. 2 years ago, I made the commitment to go help myself down in Brazil with ayahuasca—to get to the heart of what I needed to be healthy and whole. My husband refused to go with me. He was very antagonistic. I said I was going without him anyway. He came to going of his own volition and through ayahuasca and the concurrent psychotherapy, he is clean and sober, without the white-knuckling he used to have. It’s a miracle. It hasn’t changed everything for us and we still have our moments, but to deal with a sober person through those moments is so much better. In lactation consulting, I do always have to remind myself not to work harder than the patient. I want them to be successful with their goals so very much, but I can’t feed their baby for them….and I have to remember to take a step back. Great post. I should carry this on my phone as a reminder! Thank you Gabby, I really needed to hear this right now. I’ve been trying to let go of a guy friend that is toxic and depressed. I care so much for him, but realize I can’t be responsible for his happiness. I also have a very hard time saying no to him, but it’s weighing me down. So thank you, I am working on this! Buon giorno from the very heart of Tuscany! Let’s step back, let’s learn to love and appreciate the other person, let’s learn to listen to when needed with our mouth shut 🙂 and be present. Waheguru… Thank you Gabby for this holy reminder. I really needed this today. Such a blessing. Universe is so amazing ! You take me back on my way to prayer. I forgot it for a while. Feels so good. Sat Nam. Blessings Gabby 🙂 In the past I was a ‘fixer/helper’, what I discovered that while I wanted to help others with positive and insightful solutions….in fact I was the one that ‘needed’ the help and loving attention. Now…I bless others with compassion and trust that are doing the best they can from where they are at. Where do you draw the line as a mom? My son is 17—it doesn’t sound quite right to let him find his bottom but maybe that’s just me unwilling to relinquish control. I’m a Jewish mama so that’s pretty darned hard to do but I’m willing to try. Any advice? Its 158am here in Australia, i just woke up a bit ago to see my phone light letting me no theres a message . Iv been terribly worried about my sons especially my youngest who has been isolated n depressed in his room for 6 years. Over these years he has rarely come out n listens to other people n then gets disappointed n goes back into his room . I have tried to be supportive n offered Every suggestion n put things in his pathway that are useful however he just knocks them back. Today i was so frustrated when i return home , he hadn’t showered or changed he buys menulog food so he doesn’t have to go out (our government gives him money )i wish the government wouldn’t cause it helps keeping him at home in his room n no thats no good. Today i just lost it, n told him ild kick him out on the street if that what it takes to get him motivated. We have a nice home in a lovely area with plenty of opportunities for him . All of his friends don’t visit or call any more. His brothers are both out working n going to tafe paying there own way in life n very independent. I have raised my 3 sons on my own with no family n worked 3 jobs . I live in fear that he will find it all to much yet there is nothing i can do. Nothing anyone can do until he wants to be the change. I accept this but since he turned 23years on Tuesday its so frustrating seeing my son fall behind n give up n then like today then cone down stairs excited hes got a job interview. I no i have to let him find his feet But its so dam frustrating. So i guess my Angels woke me up to read your message n i must release my son ,send more loving angels n Guidance healing n Prays and believing that he will be ok n move forward into where he’s ment to be .. Thank you, Gabby! This popped into my inbox at the exact moment I needed to hear this. It’s amazing now after reading your books and becoming aware of my own journey, how I recognize where others are at in theirs and what I can and can’t do for them. Thank you for helping me release and keeping me moving forward with love. This is exactly what I needed this morning. Someone very close to me is such a negative person and I’m having a hard time dealing with being her personal baggage dumpster. I’ve been using your methods from judgement detox to try and help work thru my feelings and judgements regarding this person. Great post, Gabby. It is hard to watch someone descend to their bottom, but we have to let them. I was estranged from my parents at one point for my own well-being. When my mother hit bottom, she called me and I got her into the treatment program that introduced her to AA, and she’s been sober ever since. I have a question that doesn’t seem to be able to be answered. How do you let go, stop trying to make up, fix/heal their pain, and allow your child to hit bottom when you see and know it is in part your decisions and actions of the past that has put the child in this pain and turmoil to begin with? Thanks. Registered for mini courses and to my disappointment that your videos are not subtitling or captioning. It’s NOT accessible to me as I am deaf (or other deaf and hard of hearing people) and rely on subtitling or captioning to understand everything that’s been said. Please consider add subtitles or captioning to your future videos! Thanks in advance. This could not have come at a more perfect time in my life. Thank you so much-I am so grateful! Charlotte from Stockholm, Sweden here! I understand that there are no easy answers to this question, but generally speaking, how would you deal with a teen who is likely a Highly sensitive person (and a seer too)? Hi Gabby – Thank you for this great post – my question is – how do you accept/see someone with compassion when they have consistently hurt you ? I can accept someone for who they are, let them decide when/if they want to change – but then when exiting a relationship like that often I feel resentment or hatred towards that person for hurting me and not being good to me while they were going through their issues. How can one learn to see someone with compassion when the resentment runs deep? I have always been the fixer, the go to for support and help. But I feel like I don’t want this role any more, I want to work on me and save what energy I have for me. When I am asked for help now, I almost feel bitter and resentful that I am the go to, reliable person. This is in family and friends relationships. What would you advice be for me… is it to send them love? Because what happens is I feel guilty for feeling such a way when someone is in a low point and they are asking for help. Then I end up judging my self in a negative light. I found this very thought-provoking as I feel like the ‘fixer’ for my family and friends. I guess ‘fixing’ will be interpretted individually for each of us. I think for me, it is helping with a stream of everyday fixes for those closest to me. At times, I have felt overwhelmed by others reliance on me to ‘fix’ situations for them. I sometimes think – should I just stop being the ‘fixer’? I’ve asked, why do I keep giving so much of myself to others and I have thought through the reasons and consequences at length. I know I do impact others lives positively by the providing the ‘fixes’ and have helped them move forwards in their lives. I feel they may / or may not have eventually made the forward move without my help but by providing the fix they have benefitted. I know I could use my energy to further improve ‘fix’ myself instead of others. But I justify helping them because I have the gift of capacity to help. Also because I feel I should share the gift and not use it exclusively for myself. It is very difficult for me to entirely stop the fixing. Your words are an inspiration to me to continue to search for the best in myself and others. Thank you Gabby. This hits me so hard Gabby. I need someone to tell me to stop worrying. I feel so stupid. Really completely Ive been such a mess. I need to set boundaries with my mpther and father whos endless problems and communication issues have destroye dmy helath and my twenties. I cannot sometime believe the solution is so simple. I want to move out. walk away. Focus on my life. My happiness. Be with someone and those who appreciate and lift my soul. I sacrificed so much. But I realized its not their fault. Itès my fault. I should have been the one to draw boundaries. Now things have gotten so ugly. But theres lots of hope. I think Im going to move out. Finally. I dont have a choice. Sorry mom. Sorry younger siblings. Sorry dad. I canèt be the middle person anymore. I will sleep over sometimes. I will buy groceries when need be. But I will not tolerate anymore powerlessness black holes that I’ve been sucked into. I will keep a distance. But it’s time for me to build my own life. This one so small life I have. I haven’t even experienced so much in life. Please pray for me & my family. Going through some difficult times.